^ Title covers most of my request. The first one was a gift with a pre-order of MPO. Must be in a good condition, I don't care if it was opened, as long all the parts of the case are intact. Second one is the VR Missions disc, pretty much everyone knows about it. I'm looking for a ntsc-us version, in a really good state the cd, case and manuals. 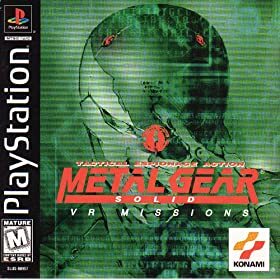 I've got 4 sealed VR Missions if you want to buy or trade for one of those, although if you plan on playing it you'll pay a tenth of a price buying an open one off of ebay. How much do you ask for one of those copies, ViolentSnake? Hey thanks for the compliment. I got about 25-30 items (maybe more) in transit so it's about to get a whole lot more impressive heh. BUT, that was pretty high, even though the seller was really happy to get one in "gem mint" condition (see my feedback). There's also be a discount if you bought outside ebay as I'd save fees. If you're interested drop me a PM. One of the four is also a bit scuffed up (no rips/tears/cracks, but some wear on shrink wrap) that I may even let go cheaper, but not by alot. You looking at $150-175 depending which you wanted. Definately at this price not recommended if you plan on opening and playing it as you can get an open one for $15-$20 in mint condition.